With the wedding just four months away, maybe it's time to meet the Maffs. Jeff and I had the wonderful opportunity to meet some of our new family members on May 6th, at the wedding of Candace and Andrew Maffett, Alex's brother. This blog will take you to their wedding day, but first let's "Meet the Maffs"---Alex and Brielle! Alex Maffett played baseball for the Richmond Spiders. He was a captain his senior year and pitched in the A10 Championship. He and Brielle both attended the University of Richmond undergrad. They were in the same social circles and had mutual friends but never met while at school. Brielle moved to Charleston to study law after graduation thinking she might never return to Richmond. She fell in love with the city of Charleston but returned to her first love Richmond and ended up meeting her true love...Alex! At the beginning of her third year at Richmond Law, Brielle and Alex went on their first date. This pic was taken at a Richmond Spiders football game on November 23, 2013. It was our first time meeting Alex. He didn't mind me taking a pic. I liked him already! In addition to meeting Alex's family at Candace and Andrew's wedding, I had the pleasure of meeting Alicia Lacey. Alicia is well know in the world of wedding photography. Her photos have been featured on top wedding blogs. I had seen her talent first hand when she photographed the wedding of one of my clients, Brittany Tilley Hanson, in the Outer Banks. I was thrilled to find out she was photographing Candace and Andrew's wedding so we could finally meet in person. We designed a custom veil for Brittany Tilley made from European net and hand cut French lace. There is nothing softer than a European net veil. It slinks, swishes, and falls how it decides to. Her veil fell from in-between her beautiful long curly locks with fresh flowers in her hair. I describe European net to my clients as rebellious. It won't listen to you on your wedding day but will be sure to create beautiful memories of a lifetime. I loved watching Alicia in action. She is warm, stylish, and comfortable at her craft. I couldn't wait to see her results while being completely confident in the outcome. Afterall...she is Alicia Lacey Photography! As much as I wished to steal a few minutes of Alicia's time, today was Candace and Andrew's wedding day. I knew it was best to let her be. The photos she captured this day would be special in many ways. On May 6th, the weather in Leesburg, Virginia, was a little damp with a bit of chill in the air. I can only imagine the beauty of Stone Tower Winery in any season, and in all weather. Enjoy this peek into the wedding day of Candace and Andrew Maffett. Every decorative detail was understated elegance. Guests felt instantly welcomed. 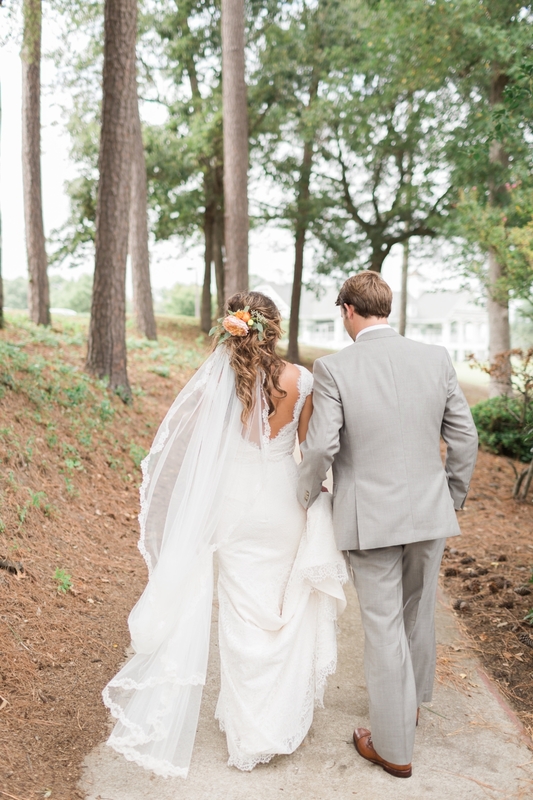 Candace's color scheme was soft with natural blush tones and greenery accented throughout. Sincerely Pete Events help her coordinate details so she and Andrew could enjoy the night. Candace's wedding dress was by Allure Romance Collection. Freshwater pearl and Swarovski crystal "Cluster Hair Pins" by Headpiece.com. Candace came to Headpiece.com in February to choose her hair accessories. She originally only wanted a veil designed, but fell in love with our beautiful Cluster pins to accent the subtle twists and curls in her classic bridal hairstyle. This pic means so much to me as a designer, mother, and lover of family. Brielle gracefully placed Candace's veil on her wedding day. Today Brielle was her bridesmaid. On October 14th, Candace will be Brielle's bridesmaid and they will become sister in-laws for life. Andrew and his groomsmen ready for the wedding. You couldn't pose this picture! Alex and Andrew...brothers and best friends. Candace and a few beauties in her bridal party. As an artist, I think of how the gray skies make this picture come alive in a way that would be impossible if the sun was shining brightly and the vineyard overtaken by blue skies. This pic is one of my favorites! There could be many captions for this photo. I love the emotion expressed. Jeff and I loved meeting Candace and Andrew's friends and family at the wedding. We enjoyed hearing stories, sharing food and drink, laughing with the bridal party, and getting out on the dance floor. Dancing has always been a big part of life in the Hunt house. Dancing in dad's arms, on his toes, at recitals, while performing family karaoke, at every fundraiser, and special event...if there is a dance floor you will find the Hunts. We look forward to calling everyone out on the dance floor on October 14th. Thank you Candace and Andrew for asking us to be a part of your wedding day and for opening the door to family. It's only four months until October "Fourteenth". See you soon!